The El Toro Marine Corps Air Station in Irvine, Calif., was built in 1942. To build the runway and roadways to aid base operations, a mixed open culvert was constructed to sit atop the Agua Chinon Creek. The base then was decommissioned and sold for development. The plan included construction of a large housing and sports complex, golf course, and facilities and acreage dedicated to landscaping and agriculture. This would require a plan to address excess storm water runoff from future development. The soft bottom portion of Agua Chinon is more than 3,000 ln ft. One of the main challenges engineers faced when designing this project was providing a habitat by maximizing areas of a natural bottom streambed, while providing the protection necessary for large rain events. The existing topography had a natural slope of more than 1.5%, which was too steep to maintain non-erosive velocities. Due to the restrictions on concrete use, the grade differential and the need for maximization of the natural bottom channel, engineers designed a natural bottom open-channel drainage system utilizing a series of 28 gabions drop structures. Each identical, the gabions span 30 ft across the channel, randomly placed to create different floodplains and foster a natural feel. 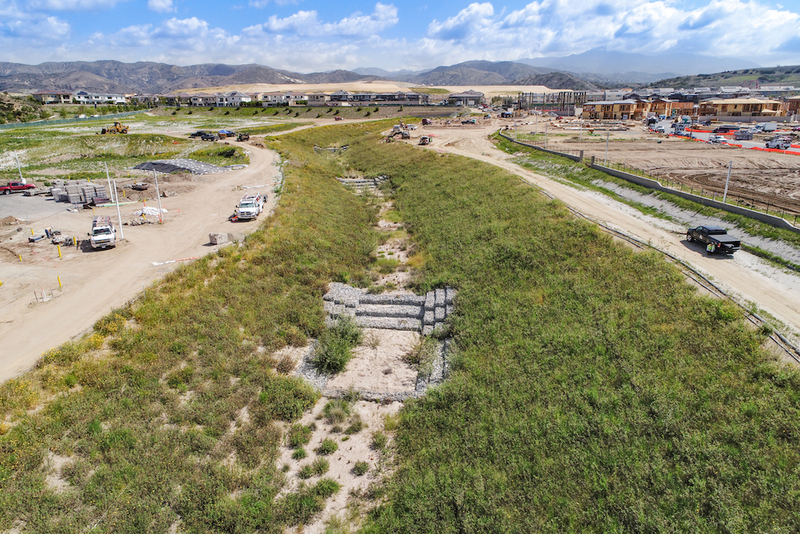 The flow rates used for design were from the amended flood control master plan for San Diego Creek that establishes 100-year runoff amounts based on future projected land use information and the county hydrology criteria. Hydraulics calculations determined the optimum slope for stability at less than 0.5%. The gabion structures along Agua Chinon Creek already have been tested by Mother Nature. In early 2018, Southern California was hit with a historical rain event that led to flooding and mudslides throughout the state. The gabion structures held up, slowed the flowing water, and controlled erosion and flooding.